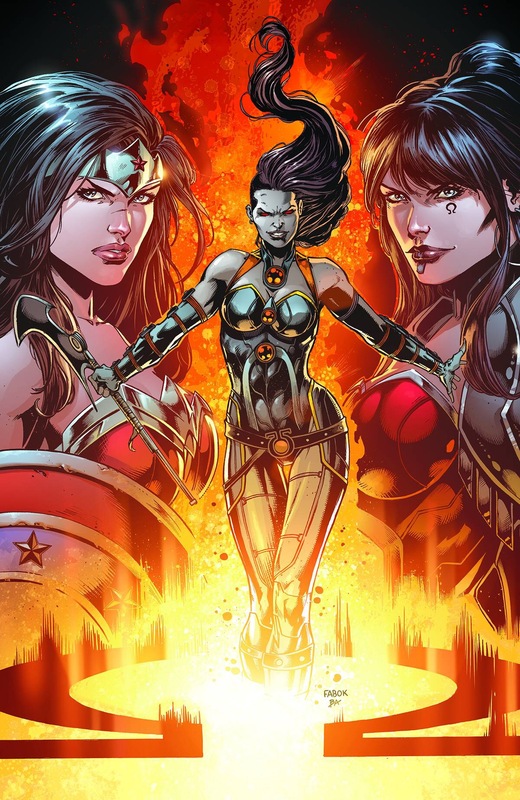 The ladies who have navigated to the center of the Darkseid War fallout claim the limelight in this special issue. Over the course of the past year the Justice League has first been fighting off Darkseid, and now Mobius. However, this special acts as a breather while elaborating on Grail’s origin, as well as Jessica Cruz’s battle to break free of Power Ring. The daughter of an Amazon assassin and Darkseid, Grail is shown as a psychopath who has little choice in life. She is constantly fighting her inner nature. It helps to provide a vague sense regret and sympathy, for the villain. Also in her clutches is Steve Trevor. His helpless captive status is nothing new for him, but does little to drive the story forward. It mostly adds to the mystery and questions of what Grail is trying to accomplish. Grail’s plans are clearly laid out for those who are familiar with the DC Universe, but have not been keeping up with the Justice League. Readers who have had previous encounters with Mobius/Anti-Monitor, the Anti-Life Equation, Darkseid and Amazons will be able to pick up on the story without being completely lost. Any readers who are new to DC might want to go ahead and pick up the last four issues or so, starting with issue #45. They’re fun reads that are discounted already in digital format, and begin with the fallout from the death of Darkseid. The title “Darkseid War” is not an exaggeration. It has been full on, drag out fight, that did not end with destruction of one of DC’s biggest villains. The secondary story that Johns tackles is much more fascinating. In issue #48 of Justice League, Jessica Cruz’s soul and personality were officially trapped in Power Ring, allowing its devious owner to take full control of her body. While given a brief glimpse of what that means for Hal Jordan “on the outside” the central focus of the story is on Jessica’s struggles inside the ring. For those unfamiliar with Power Ring, it is a mirror-verse like character of the Green Lanterns from Earth-3. Villainous in intent, it is powered by fear and cowardliness, the desire to survive. When first introduced, Jessica Cruz was a trauma survivor who had locked herself away from the world, and once again victimized by having the Power Ring entity taking her by force, as its host. On the surface, that is a very problematic character to tackle and hold up as a hero. What has been keeping her story supported is this prophetic promise that has constantly been hinted at that she will one day be one of the greatest Green Lanterns, ever. Rebirth announcements have also shown that her time to take on the ring of willpower is just around the corner. If you have been waiting to see the story of her transition you must get this issue! This story is that major step where she shows her ability to fight fear and allow her willpower to take control of her choices. It would be very easy to reveal how this happens. However, watching her choices and responses unfold inside the ring is so empowering. It’s worth the cover price alone for this story. Having art teams break down different aspects of a story can be a dangerous choice sometimes. However, there was a clear intent to have teams that compliment each other. Jessica Cruz is given a specific art team, while Grail and her mother receive another, and Grail’s flashbacks still another. This helps with the back and forth throughout the book that occurs. Readers are able to clearly distinguish which part of the story they are jumping to as they turn the page. It’s not a jarring effect, like it could be on some books. Instead, it provides a nice transition between the different plot points. Most of the flashback sequences stick to traditional panel and gutter layouts. At first, Cruz’s adventures inside the ring throw traditional white gutters out, in favor of black borders and full pages of color. It provides an extra feeling of paranoia and uncertainty. Only once her action gets going and a passage of time, as she is moving, is needed do white gutters and backgrounds make an appearance. Grail’s slinking around, naked, in a cave is dark, ominous and heavy on blacks and reds. Alex Sinclair’s color work is the glue that holds this issue together is a gorgeous fashion. If you’re not a fan of the more house style of DC superhero art this might not be the book for you. However, the dynamic art holds this issue together, despite little actual action happening in the story. This is a very subtle special, that lays more fine details in place that will play-out in issue #49 of Justice League later this month. It also acts as a good introduction point for those who are familiar with the DC Universe, but haven’t been keeping up. If you’re going to read Sam Humphries’s Green Lanterns this summer, get this book. If you’re going to be reading Justice League with Rebirth, get this book. If you’re wanting to understand the events that have been leading to Rebirth, get this book. Darkseid War has not been an overly fluffy event, but a carefully laid out story leading to something much bigger. This special acts as a great way to shine a spotlight on the women heroes and villains who are pulling the strings.